The new disc of James MacMillan's setting of the Stabat Mater includes a list of major settings of the past, composers ranging from Palestrina to Dvorak, Szymanowski & Poulenc. The list is illuminating, there are no British composers. Post-Reformation, this is no surprise as the Stabat Mater does not feature strongly in the Anglican liturgy, and the poem does not seem to have inspired pre-Reformation British composers in the way other sections of the liturgy did. So this new setting by James MacMillan is doubly striking. Premiered by Harry Christophers, the Sixteen and the Britten Sinfonia in Autumn 2016, the same forces have recorded the work for this new release on the Coro label. The Stabat Mater is part of a new initiative from the Genesis Foundation and they have already commissioned new Stabat Mater settings from Alissa Firsova, Tonu Korvits, and Matthew Martin (see my review). The sustained intensity of the poem makes a musical setting a tricky proposition. 20 verses of intense identification with the sufferings of the Virgin at the foot of the cross. It projects a very particular personification of the suffering of Christ, and seems a text unlikely to attract non-believers in the way that there as a rash of 20th century mass settings by agnostic and atheist composers. Though other settings have appeared recently, such as that of David Bednall (see my review). 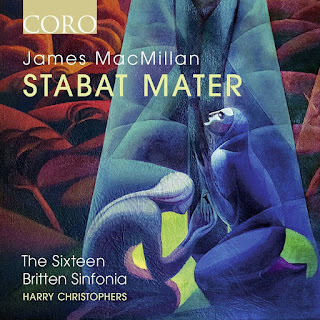 James MacMillan's relationship to the Stabat Mater dates back to his childhood, singing it as a hymn at school, and in his local church. In his article in the CD booklet, MacMillan refers to the way the work coloured his early perception of the crucifixion with its beauty and sadness. The disc opens with the plainchant Stabat Mater, sung at quite a high pitch with men and women alternim. The main setting is a remarkable, sustained 55 minutes. MacMillan writes for choir (26 singers), and string orchestra (22 players), and draws on a number of soloists from the Sixteen, Julie Cooper, Daniel Collins, Jeremy Budd, Ben Davies, Mark Dobell, Simon Berridge and George Pooley, as well as as solo for the leader of the Britten Sinfonia, Thomas Gould. But to say that the setting is for choir and strings is to mislead to a certain extent, as the two rarely perform together for any sustained length of time. Instead the two alternate, with MacMillan interleaving and overlapping their contributions, the strings sometimes interrupting the singers. The strings amplify and intensify the emotional drama and providing changes in texture necessary in such a long work. MacMillan's writing for the choir mixes his familiar chant inspired style with other quasi aleatoric devices to create an array of profoundly expressive choral textures; by turns moving, poignant and dramatic. This is a setting which is alive to the personal drama of the text, and there are moments of real violence. MacMillan uses repetition to striking effect in the text, to produce remarkable passages of emphasis or questioning. The string writing frequently has a drama and violence to it which is equally striking, and in style I kept coming back to the music of Bartok and other Central European composers. Certainly MacMilllan's string writing has a pan-European feel and complexity which is far removed from the English tradition of string writing. In a sense, MacMillan has crafted his setting from a series of compositional devices which he uses to articulate, amplify and point the text. But his genius is in the way he merges all these devices into a sustain arc of concentrated intensity. There is nothing over 'clever' about the piece, nor is it simplistic. It is a sustained and deeply felt essay, and a work of genius. It receives a very strong performance. The clarity of The Sixteen's technique brings out the expressive beauty of the choral writing, but the singers are able to flare with violence too. They are complemented by a performance from the Britten Sinfonia which matches them in intensity and vividness. I missed the live performance of the work and am delighted to be able to make its acquaintance on disc. I am sure that further live performances will be something to which we can look forward.